The thyroglobulin antibody test measures the thyroglobulin antibody blood level. Why is a thyroglobulin antibody test important? The thyroglobulin antibody blood test can help identify an autoimmune cause for a thyroid disorder. This Thyroglobulin Antibody Test is a blood test. The thyroglobulin antibody test, also known as a thyroglobulin antibody blood test, TgAb test, and anti-thyroglobulin test, measures the thyroglobulin antibody blood level. Thyroglobulin (Tg) is a protein produced by the thyroid that is used to make the thyroid hormones, T3 and T4. Thyroglobulin is broken down by the liver and thyroid. For whatever reason, the immune systems in some people treat their own thyroglobulin as a foreign invader and generate proteins called antibodies that specifically target thyroglobulin. These thyroglobulin antibodies impair the function of thyroglobulin and the thyroid gland as a whole. Anti-thyroglobulin antibodies (ATAs or TgAbs) are frequently associated with Hashimoto's thyroid disease which is why the thyroglobulin antibody blood test is part of the Hashimoto's blood test panel. Thyroglobulin antibodies are sometimes found in people with hypothyroidism caused by Graves' disease and thyroglobulin antibody testing is sometimes added on with the Graves' disease test panel. Thyrogloblin antibody lab testing is also sometimes used when screening for recurrent thyroid cancer. To get a thyroglobulin antibody test near you, simply order online and get tested at your selected lab. 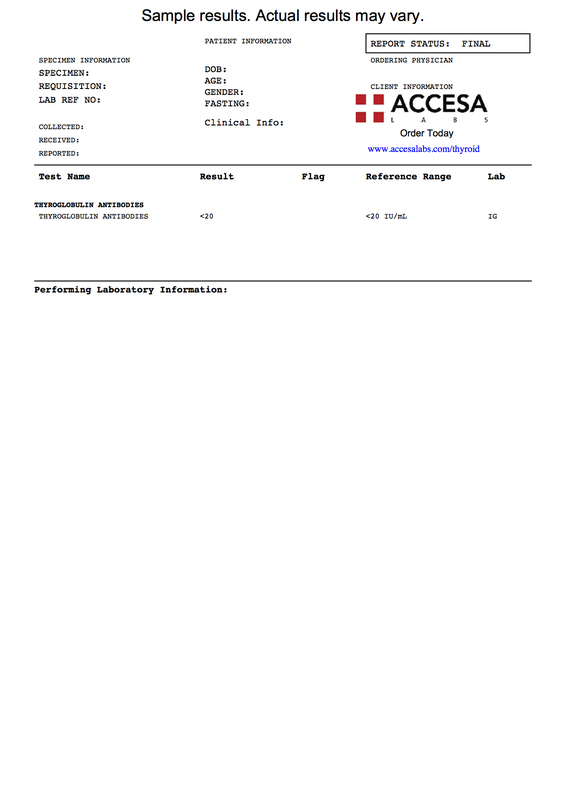 As can be seen on the sample report above, your TgAb blood levels will be reported as a numerical results in IU/mL units and can be compared against the ATA reference range provided by the laboratory. Thyroglobulin Antibody Test at Guaranteed Prices.